Starbucks is serving an all-new coffee beverage and, believe it or not, it's not a latte, Frappuccino, or brewed coffee drink you might expect from the caffeine giant. 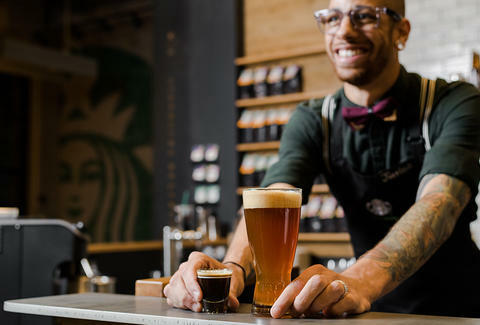 In fact, the bold new menu item is more of a cocktail in that it brings coffee and beer together in what's been billed as a "first-of-its-kind Starbucks beverage." Seriously. "Espresso is shaken over ice with orange pieces and a touch of sweet vanilla. Shaking the espresso produces a rich cloud of micro-foam with accents of citrus and vanilla. The foam is layered on top of a freshly poured IPA, and the beer is served with the cold-shaken espresso shot on the side. It’s a beautiful presentation with a fun twist, as pouring the shot over the beer creates a tantalizing, layered waterfall of espresso and craft beer in the glass." Sure, tossing a shot of espresso into a pint of beer sounds kind of weird, but the aforementioned flavor combinations and visuals are what make this drink so interesting, appealing, and from what it sounds like, refreshing. But as we mentioned before, you'll have to find one of the boozy Starbucks Evenings locations in order to get your hands on one. Cheers. Tony Merevick is Cities News Editor at Thrillist and just has to find a Starbucks Evening location now. Send news tips to news@thrillist.com and follow him on Twitter @tonymerevick.